Only the ten most recent Program posts are shown here. 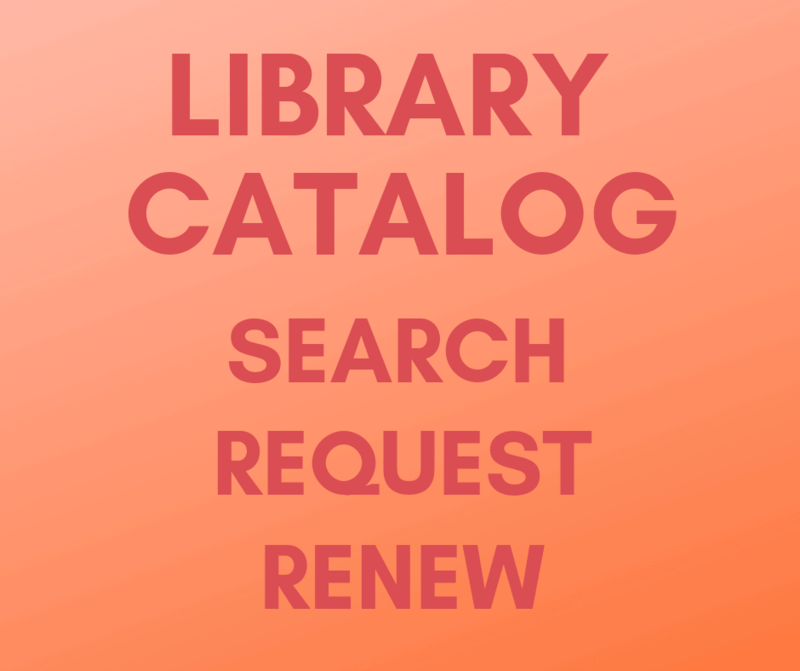 Go to All Programs Archive for complete listings. Moyna is a musical duo from Seattle, which is made up of Palbasha and Durjoy Siddique. Both musicians originate from Bangladesh. They sing both in their native language of Bangla, and also create music sung in English. Palbasha Siddique, the voice of Moyna, is a Bangladeshi born American singer. She is best known for her performance of Praan, a song adapted from the collection of poems Gitanjali by Rabindranath Tagore, with music composed by Garry Schyman for Matt Harding’s “Dancing 2008” video. She has performed in a variety of music styles both in the US and Bangladesh. Durjoy plays acoustic guitar in the duo. As a duo of two lovebirds, Moyna is constantly in the search of finding new sounds which resonate the meaning of love. Their most recent performance was at the World Rhythm Festival in Seattle Center, where Moyna focused on Bangla folk music, which has immensely deep lyrical themes. These concerts, in the main area of the library, reflect a wide range of musical styles, genres, instruments and cultures. Audience members receive cultural passports, which will be stamped at each concert. Attendance at all five makes them eligible to win a gift certificate to a Hudson music venue. This project is made possible with funds from the Decentralization Program, a regrant program of the New York State Council on the Arts with the support of Governor Andrew M. Cuomo and the New York State Legislature and administered by the Greene County Council on the Arts. Program Description: Join us for a dance class series, brought to you by a collaboration of the City of Hudson Senior Center and Hudson Area Library. 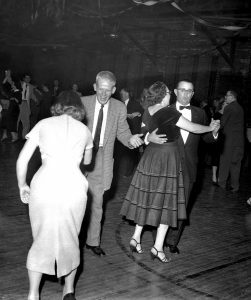 The series ends with a live music dance party open to the public with the Fabulous Versatones: the Spring Fling Swing Dance at the Armory. Dances studied in the class include waltz, foxtrot, tango, swing, cha-cha, hustle, rumba, and merengue. Date/Time: Fridays, 5:30-7pm, April 26, May 3, 10 & 17. Live music dance party: Saturday, May 18, 7-10pm. Recommended Audience: Free and open to the public of all ages. Attendees do not need to attend with a partner. Beginners are welcome. Registration: Registration is required for the class and appreciated for the dance party. To register please visit the main desk at the library, call 518.828.1792 x101, or email programs@hudsonarealibrary.org. Andrew Resto is a professional certified Bronze level dance instructor who has trained in the Arthur Murray and Fred Astaire systems. He has taught in ballroom studios in Hollywood, New York City and in upstate New York. Program Description: We are pleased to announce our Mad Hatter’s Wearable Art workshop during spring break for tweens and teens (8-17 years old) in collaboration with Processional Arts Workshop (PAW). Participants will learn how to create giant masks, head-pieces, and puppets for an art parade in Hudson, NY. Drawing inspiration from worldwide Carnivale and masquerade traditions, this class explores how to design and construct large, lightweight wearable art for parades, theatre, and performance. NYC Halloween Parade designers Alex Kahn and Sophia Michahelles emphasize a process of visual storytelling, introducing a range of low-tech, high-impact techniques to transform Hudson’s stories into performance art. The final creations will take to the streets for the city’s 1st Annual Mad Hatter’s Parade on May 11, celebrating Hudson’s industrial past and emerging future as a city of makers. Alex Kahn and Sophia Michahelles are co-directors of Processional Arts Workshop (PAW) a non-profit that works with communities to create site-specific processions, parades and immersive performances. PAW’s performances involve local volunteers in every stage of production, integrating pageant puppetry, mobile architecture, shadow and projection, and mask and costume, to reflect on distinctively local themes, issues, and narratives. Their work has appeared in locales worldwide, as well as at New York’s Socrates Sculpture Park, the High Line, Trinidad Carnival, the PEN World Voices Festival, Miami’s Vizcaya Museum, the NY Architectural League’s Beaux Arts Ball, and Rhinebeck’s Sinterklaas Parade. 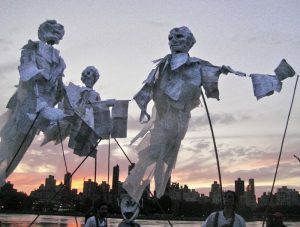 Since 1998 PAW has created large-scale puppet performances to lead New York’s renowned Halloween Parade for a live audience of over one million spectators. In 2016 Alex and Sophia had the honor of staging a performance at the White House for the Obamas’ Halloween celebration. PAW’s work has been recognized with numerous awards, including a Fulbright Scholarship to Trinidad, a CEC Artslink Grant to Ukraine, and a Witt Fellowship at University of Michigan. Kahn and Michahelles have lectured on Carnivalesque performance art at Columbia University, The New School, Bard College, Maine College of Art, and University of the West Indies. Recommended Audience: This event is free and and open to the public. Attendees are encouraged to bring an article of clothing for repair. All sewing materials needed for making garment repairs will be provided. 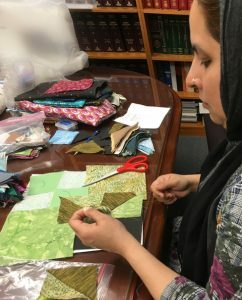 During weekly workshop sessions Stitching Exchange participants began by plotting their home countries on a map and overlaying a few details such as their names written in English and their native languages. They included what (or whom) they missed from home. In a later session, they used this information, embroidering a word that referenced what is important to them on a hand stitched pillow in English and their native language. A selection of these colorful pillows will be on display at the Hudson Area Library, leading up to the Mending Day event. 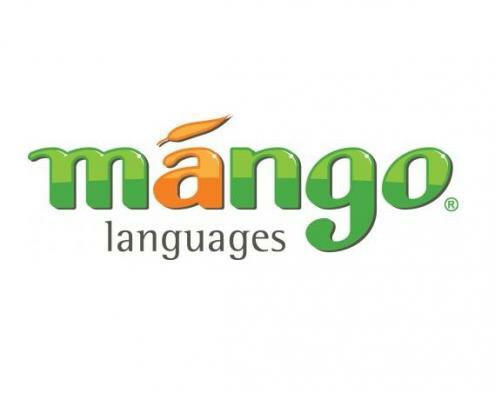 Each week the women developed their English language skills. All of the women attending the workshops had some hand sewing skills and this made learning English that much easier. And the opportunities for choosing color, pattern, and designing has allowed for some fun creative expression. Many of the women were interested in learning to use a sewing machine or to increase their knowledge of this useful skill. After hand stitching their pillows, each woman had the opportunity to attach the backing fabric to their pillows using the sewing machine. 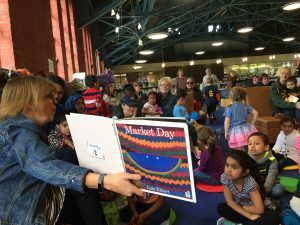 Hudson Family Literacy is a program through Columbia Opportunities, an organization that “helps solve poverty-related problems in our community”, explains director Tina Sharpe. The women who run the Hudson Family literacy program: Sophia Becker, Jewel Chestnut, and Hosneara Kader have worked together for over 20 years. Their suggestion of offering an incentive to increase attendance for Stitching Exchange became an opportunity. The women were told that whoever came to the most workshop sessions could win a sewing machine to take home at the end of the project. Ms. Sarris contacted her community and several sewing machines were donated. If you have a working home sewing machine you would like to donate please contact her at: melissasarris2@gmail.com. Program Description: The City of Hudson Senior Center and the library continue watercolor painting with local artist Gretchen Kelly this spring season. April 20: features April showers bringing May flowers, Easter bunnies, chicks, and colorful eggs. May 18: flowers and fruit still life, the May Pole imagery, Spring elements like birds, sprouts, and planting images. June 15: flower still life, Father’s Day cards, picnic imagery, bees, butterflies, and Flag Day. Each of these three workshops can add to developing regular attendees’ personal calendars featuring their watercolor painting. All materials will be provided. Recommended Audience: All ages, beginner and intermediate painters welcome: children accompanied by parent, teens, adults, seniors. 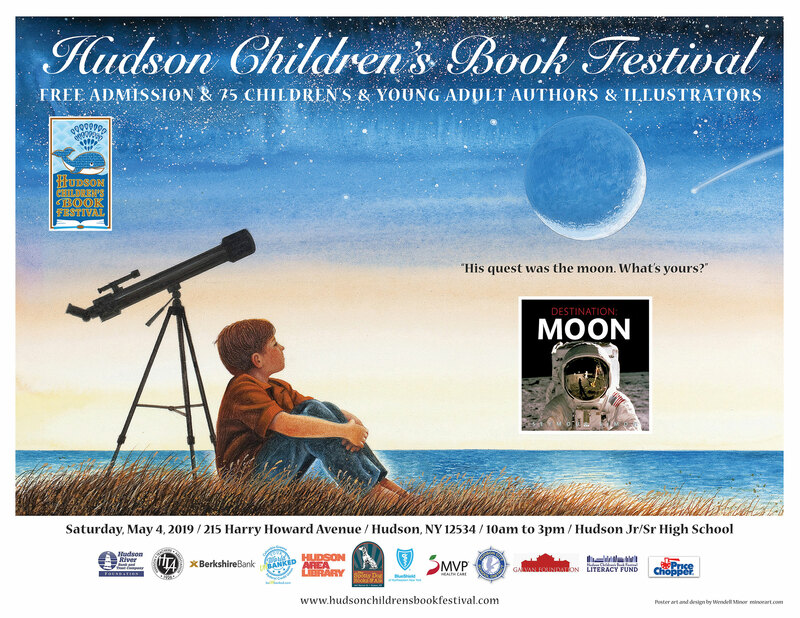 Program Description: Story Time programs, crafts and activities, raffle prizes, and a shop will all be in the library tent at Basilica Hudson’s Spring Farm & Flea. 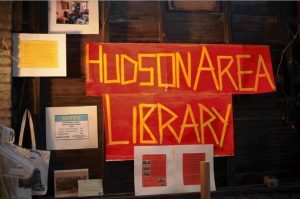 The library’s Tween Advisory Council is selling t-shirts they designed and the History Room has items including tea towels, tshirts, postcards and notecards with historic Hudson image and giclèe prints of 1881 and 1923 Aeroview maps of Hudson. Come by Basilica Hudson’s amazing Farm & Flea and support our Tween Advisory Council and our History Room! Admission is $5 for the weekend, children 12 and under are free. 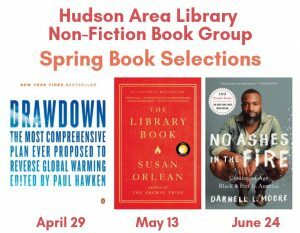 Program Description: Spring is here and so is an exciting lineup of book selections from the library’s Non-Fiction Book Group. 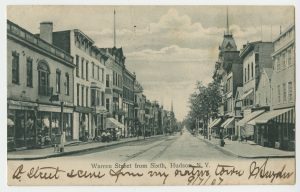 Recommended Audience/Registration: This monthly group is open to the public and focuses on history and social and political life in North America and is facilitated by library Board President Mark Orton. To register for the book group email morton@hudsonarealibrary.org. These books are all available for borrowing through the Mid-Hudson Library System. 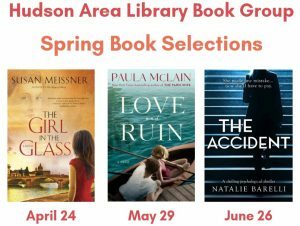 Program Description: Spring is here and so is an exciting lineup of book selections from the library’s General Reading Book Group. Recommended Audience/Registration: This monthly group is open to the public and is facilitated by long time member of the Friends of the Hudson Area Library, Sharon Getty. To register for this book group email programs@hudsonarealibrary.org. A young woman, a long-awaited trip to Florence, and a woman who claims a relative from Renaissance times speaks to her through the masterpieces from that lustrous time make up the frame of The Girl in the Glass. The Washington Post named Love and Ruin one of the Best Books of the Year. The novel is the story of Martha Gellhorn, a war correspondent during the Spanish Civil War and the third wife of Ernest Hemingway. The Accident is a chilling psychological thriller. Andrew Resto, a professional certified Bronze level dance instructor, will be leading a short lesson and demonstration during the dance. High Five! 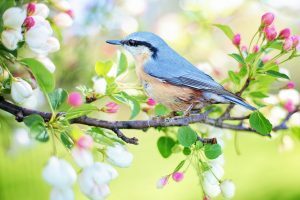 Talking, Singing, Reading, Writing, Playing with Your Child Spring 2019! Program Description: The library’s and Greater Hudson Promise Neighborhood early literacy program “High Five!” is back. Our new spring session includes “Using Gardening Activities to Develop Literacy”, “Literacy Activities to do on a Rainy Day” and trips to Hudson Farmers’ Market, Greenport Conservation Area and Hudson Children’s Book Festival. Each week the program begins with Story Time in the library with High Five! facilitator Kathy Mabb and special guest readers including the ladies of the Greenport Garden Club, crafter Robin Weber, and educators Pamela Badila and Hosneara Kader. Crafts and literacy activities, with an emphasis on dictated writing, follows. Families will also have the opportunity to explore the hundreds of high-quality children’s books available for check-out at the library. Participants will receive free books and prizes each week. 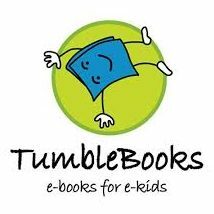 Gift certificates to Rolling Grocer 19 and Hudson Children’s Book Festival will be awarded to all families with excellent attendance! Lunch is also provided and we will be emphasizing healthy foods kids like to eat. Date/Time: Saturdays, April 13, 20, 27, May 4 & 11, 11am – 1pm. Registration: To register for High Five!, email programs@hudsonarealibrary.org, call 518-828-1792 x101, or stop by the desk at the Hudson Area Library. Transportation to the library is available upon request. Target Audience: Families with children birth to 6 years old. Older siblings welcome. High Five! facilitator Kathy Mabb is a dedicated educator with over thirty years of teaching experience in Columbia County including as child care director and parent educator at Questar’s Teen Parent Education Program. Working with children and their parents has always been her passion, and her belief that communities should nurture their youngest members and their families, makes her a good fit for High Five! The Greater Hudson Promise Neighborhood is thrilled to be partnering with the Hudson Area Library for the High Five! early literacy program. The GHPN works to support children and families in the Hudson City School District from birth through college to career. Promise Neighborhood, established in 2011 through a Planning Grant from the US Department of Education, has built a strong foundation of partnerships and programs supporting families in the Hudson community and beyond.